I went looking for Vester girl knowing she was in our tiny house and found her 10.30pm under our special needs son's bed giving birth to 4 fluffy kittens...with fusion in my lower back this wasn't easy. 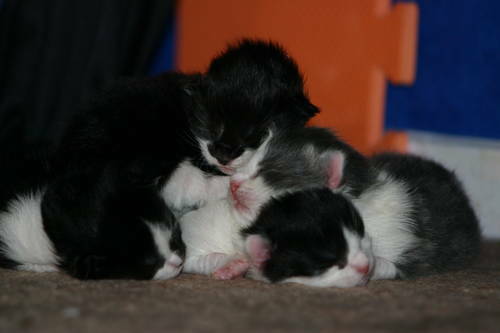 Your right km they grew to fast, the two males (Patches and Pirate)are bigger than their mum now. A feline mountain! I'm glad you got a picture of them when they were so young as they grow up too fast.